Just because the weather turns cold doesn’t mean you have to go into hibernation mode. 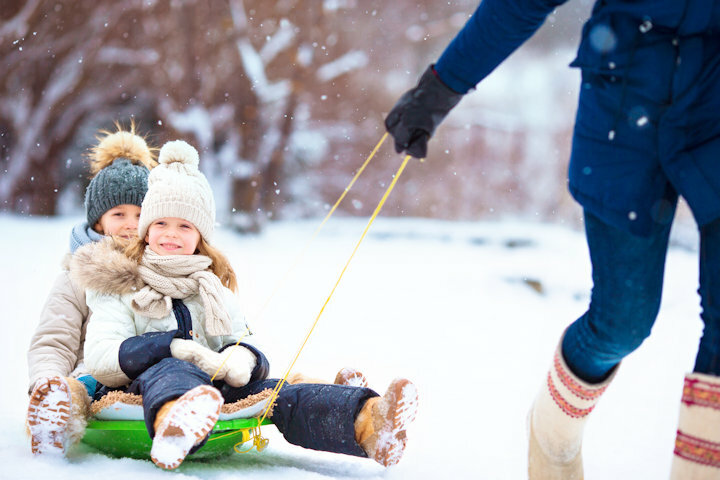 Throw on a coat and scarf and head out to try some of these fun (and frugal) winter activities the whole family is sure to love! Even if you don’t have the energy to cover your own house in twinkle lights, you can still enjoy everyone else’s hard work! Pack the family into the car with a thermos of hot chocolate and take a drive around the neighborhood after dark to enjoy some bright and shiny holiday lights. This activity is sure to be a hit with the kids, but it won’t be a hit on your wallet! Find a nearby hill and load your sleds and saucers into the car. Not only will your kids have a blast, but they’ll be so tired by the end of the day that you’ll have a quiet evening at home afterward. No holiday season would be complete without cookies! Gather your kids around the computer and cruise Pinterest for some fun holiday cookie ideas then head to the store for supplies. When you get back home, throw on some holiday music and bake the day away! You’ll be enjoying the fruits of your labors for weeks (okay, maybe days) to come! You don’t have to pay for the premium channels to find your favorite holiday movies. Most streaming services load up their queues with classic movies around the holidays and there are always marathons on TV. If you can’t find your favorites, try something new – it might become a new favorite! If not, you can always get a good laugh at how corny it is. Crafts are always a hit with the kids and the best part is that you can recycle things you already have around the house! Take those Christmas cards from last year and leftover wrapping paper to make some fun and creative holiday decorations for the new season. If you’re a little low on supplies, you can’t go wrong with some printer paper and a pair of scissors to make an endless pile of snowflakes! If you love to entertain but you don’t want to deal with the expense of a full dinner party, why not throw a holiday potluck! Make some holiday-themed treats and a warm beverage then ask your friends and family to bring their favorite holiday dish. If you’re really feeling festive, gather everyone around to sing your favorite holiday carols (maybe after a glass of eggnog or two). If the winter rolls in and you realize that your closet is a little empty, don’t feel like you have to spend a small fortune on a new winter wardrobe. Get some of your friends together for a winter clothing exchange! This is also a great idea to get some easy gifts for your kids if they need new clothes. These fun and frugal winter activities are a great way to build memories (and snowmen) with your family. Try a few of them out and you just might make a new tradition!